It is now widely accepted that a huge meteorite impact 65 million years ago in the Yucatan Peninsula of Mexico contributed to the extinction of the dinosaurs. Without the dinosaurs, mammals were able to proliferate and evolve into a wide variety of land and sea animals. A meteoroid is a celestial body composed of rock or metal ranging in size from a dust grain to about 10 meters in diameter. Asteroids are larger than meteoroids, but smaller than planets. Comets contain frozen liquids or gases that evaporate and create a luminous tail as the objects approach the sun. A meteor or shooting star is the visible streak of light that occurs when a meteoroid enters the Earth's atmosphere. The portion of a meteor that survives the passage through the atmosphere and reaches the ground is called a meteorite. 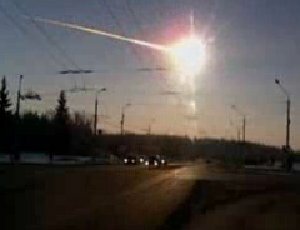 On February 15, 2013, a meteor streaked over the city of Chelyabinsk with a population of 1.1 million, in Russia's Ural Mountains near the border of Kazakhstan. There were many sightings of a thick ionization trail and a bright flash as the meteor exploded in the atmosphere. Shortly after the flash, there was a loud boom and there were subsequent booms as the smaller fragments broke up. The shock wave of the explosions damaged buildings and shattered windows throughout the city. More than 1000 people were injured by flying glass. The meteor was estimated to have a diameter of 17 meters (55 feet) and an explosive force of 500 kilotons. Scientists had warned that an asteroid known as 2012 DA14 with an estimated diameter of 50 meters would pass harmlessly within 17,100 miles of Earth later in the day. Comets and asteroids often break up under gravitational stress into multiple pieces which then follow similar orbital paths, but scientists concluded that the Chelyabinsk meteor was not associated with 2012 DA14 because they had very different trajectories. We tend to think of meteorite impacts as being rare events, but on September 15, 2007, a chondritic meteorite of approximately 1 meter in diameter crashed near the village of Carancas in the Puno Region, Peru, near the Bolivian border and Lake Titicaca. 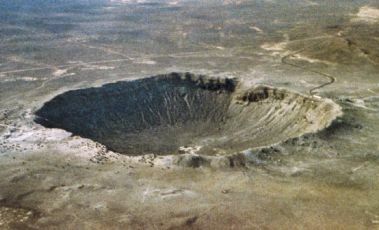 The impact created a crater about 4.5 meters (15 ft) deep, and 13 meters (43 ft) wide. Many local residents became sick from noxious fumes emitted from the crash site. A more recent impact happened on January 18, 2010 when a meteorite the size of a mango weighing 308 grams punched a hole through the roof of a medical office in Lorton, Virginia about 15 miles from Washington, D.C. Many witnesses along the east coast of the United States reported seeing the luminous meteorite trail. Experts from the Smithsonian Institution's National Museum of Natural History confirmed that the meteorite was a stony chondrite meteorite with a dark fusion crust formed by the heat of its passage through the atmosphere. The Barringer Crater, also called Meteor Crater, near the city of Winslow in the northern Arizona desert of the United States was created about 49,000 years ago during the Pleistocene epoch. 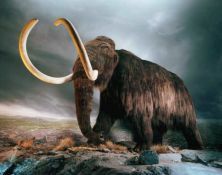 At the time, North America was mainly open grassland with some woodlands inhabited by woolly mammoths, giant ground sloths, and camels. The impact happened soon after the emergence of modern humans, but before they populated America. The crater is about 1,200 meters (4,000 ft) in diameter, and 170 meters deep (570 ft). 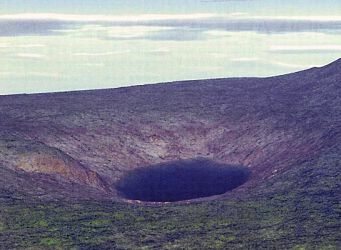 The crater was formed by a nickel-iron meteorite about 50 meters across which weighed approximately 300,000 metric tons. The meteorite is called the Canyon Diablo meteorite and some of its fragments are displayed in many museums throughout the world. Comet explosion over Canada 12,900 Years ago. Approximately 15,000 years ago, the Earth started coming out of an ice age. There were glaciers several miles thick in North America which trapped great volumes of water, and the sea level was 130 meters (426 feet) lower than today. As the weather warmed, a land bridge opened between Alaska and Siberia. This allowed humans to walk from Asia to America and establish new colonies. At the time, the wildlife in North America was like Africa. There were huge animals like mammoths, giant sloths, camels, and saber tooth tigers. The Clovis people, who had spread throughout what is now the United States, hunted these animals with finely-crafted flint spear points and arrow heads. And then, around 12,900 years ago, all the large animals disappeared from North America, and with them, the Clovis culture. Scientists had thought that the Clovis people had annihilated the megafauna, but new studies reveal that the large animals and the Clovis people themselves were destroyed by a comet explosion over south-east Canada, around the great lakes. The explosion was so bright and so intense that it ignited much of the vegetation of North America. The forest fires created a layer of black dirt which became mixed with a thin dusting of microscopic diamonds from the comet. [1,2,6] The smoke and dust from the impact blocked the light of the sun for many years and the global temperature dropped, creating a rapid return to glacial conditions. Without vegetation, the large herbivores could not survive, and the carnivores were left with nothing to eat. 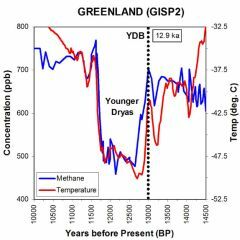 The catastrophe started what is now called the Younger Dryas cool interval, which was a period of cold weather lasting approximately 1300 years. Charred band at Murray Spring, Arizona and temperature graph from Greenland GISP2 ice core data. 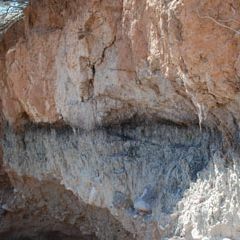 A band of dark sediment at Murray Spring, Arizona contains evidence for a cosmic impact that started an abrupt period of global cooling and a mass extinction in North America. Similar deposits have been found in five other widely separated locations: Bull Creek, Oklahoma, Gainey, Michigan, Topper, South Carolina, as well as Lake Hind, Manitoba, and Chobot, Alberta, in Canada. The highest concentrations of extraterrestrial impact materials occur in the Great Lakes area. So, where is the crater from the impact? The scientists explain that a highly fragmented object in the form of a swarm of carbonaceous chondrites or comets would have produced multiple airbursts and possible surface impacts whose effect on the Earth's surface could have been obliterated by erosion. It is also possible that the Laurentide Ice Sheet, which covered large areas of North America during the last Ice Age, was thick enough to mask the impact. Richard B. Firestone of the Lawrence Berkeley National Laboratory, also thinks that a 10-kilometer-wide comet could have hit North America 12,900 years ago. 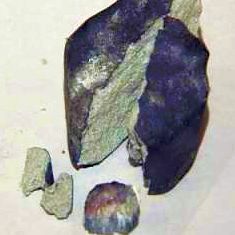 [4,6] Magnetic metal spherules have been found in the sediment of nine Clovis sites in Michigan, Canada, Arizona, New Mexico and the Carolinas. 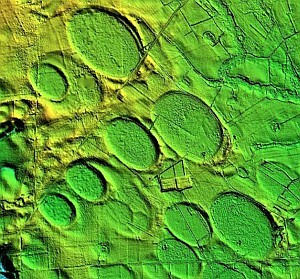 Low-density carbon spherules, charcoal, and excess radioactivity were also found at these sites. A large number of bays are thought to have been created by oblique impacts from chunks of ice ejected by an impact on the Laurentide Ice Sheet. Oval bays have been found in Nebraska, Kansas, New Mexico, Georgia, North Carolina, South Carolina and Virginia. Projections of the major axes of the ovals intersect in central Michigan along the Great Lakes suggesting that this was the impact point of the meteorite or comet. Most of the surface of the eastern shore of the U.S. is covered with a great density of bays. Each of the ejected ice chunks that created the one-kilometer-long bays would have weighed over 2 million metric tons. The fauna living at the time of the impact would not have been able to avoid getting hit by the intense barrage of massive ice boulders. Any survivors would have found their habitats completely destroyed. On the morning of June 30, 1908, an asteroid entered the earth's atmosphere in Russian Siberia causing a great explosion at an altitude roughly ten kilometers in the atmosphere. Witnesses in the nearby towns saw a luminous trail across the sky followed by a brilliant fireball. 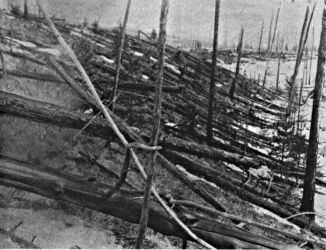 The force of the impact flattened trees 30 kilometers from the central point in the Stony Tunguska River Valley and trees were burned as far as 60 kilometers away. The blast destroyed over 6,000 square kilometers of forest. The energy released by the blast was in the range of 30 megatons of TNT. According to an Italian research team, Lake Cheko in Tunguska, Siberia, is the most likely impact location.